Click on the Amazon "ad" to the right if you'd like to purchase this book! Gilbert’s first marriage ended, suffice it to say, in a flaming ball of fire. And upon falling in love a second time, she was skeptical about entering into another marriage. I can get this! Having “failed” once, who wants to go running back for more? I don’t care how much one loves somebody, it’s a frightening concept to try again at something that didn’t work the first time. Some of Gilbert’s research is interesting and I hadn’t realized that men benefit more from being married than women do (although it makes sense.) Apparently men are happier, healthier and more financially stable when they are married. Women, however, don’t benefit nearly as well. Income is likely to drop by seven percent for married women. They are more likely to suffer from depression and die in a catastrophic accident. Maybe because most married women are so stretched … working, caring for a husband, children and home is a lot of work and the book says that most men don’t share equally in the household or child-rearing responsibilities. It is also said that women who wait to get married until they’re more established are more likely to be happier when they’re married. So, having read most of this quick read, my advice to women is WAIT! I was a “baby” when I got married at twenty-two and had my first child when I was twenty-six. 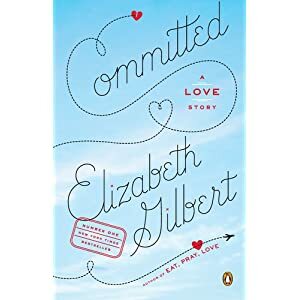 I absolutely agree with Gilbert that you can lose yourself in marriage. Especially when there are children. I have been reclaiming myself for the last few years. I’m not saying that I have regrets because being able to stay at home and parent my three kids was a blast. I really enjoyed it and I was (and am) a good parent. Anyway, I loved volunteering in my community and we had a great neighborhood babysitting co-op when the kids were little so I had a great support system. My children became my life and I let myself slip to the back of the line. Everyone else’s needs came first (partly because they were more vocal, I think) and I didn’t understand the premise that if you don’t take care of yourself, you can’t care for everyone else. Needless to say, when my youngest went off to school, my world came crashing down in a horrible bout of depression that put me in bed for nearly six weeks. It was debilitating and frightening and there were times when I truly believed that I was going to die. One of my doctors wanted to do a spinal tap and that’s what sent me to a new doc who diagnosed my with depression and put me on medication and, sure enough, after a couple of weeks I was able to get myself out of bed and out into the sunshine and back into life. It was the start of me taking time for myself and investing in myself – I started walking regularly and seeing a great therapist (or three) who have helped guide me to knowing myself. I’ve been extremely fortunate to be able to get off the meds and haven’t had a relapse in years. I used to have a bit of a “down turn” at the end of summer when the kids went back to school. No dancing in the aisles at Staples for me! I tend to wear my heart on my sleeve and can get upset, don’t get me wrong. I’ve spent several days at a time in my house/apartment/condo when my mother died and I was grieving. I did the same several months later when we buried her. The good news is that I know where to go when I need to get help and I now have the tools that I need to get myself back “on track”. I’m a lot happier when I remember to do something for me … and my knitting feeds that piece! This entry was posted in Living and tagged adventure, depression, Family, gratitude, love, marriage, mistakes, parenting by lindarockwell3. Bookmark the permalink.